This handbook was developed to accompany the Quality Scorecard for Blended Learning Programs and to provide blended learning program administrators with a resource based on the best practices identified by our panel of experts in blended learning. In this handbook, descriptions have been provided for all 70 indicators along with recommendations for meeting each standard. A special thanks to Dr. Shelton, who led the research to develop the Quality Scorecard for Blended Learning Programs and continues to identify new ways to support faculty, staff, and administrators in their quest to create quality learning experiences in online, blended and digital learning as a whole. As we find new ways to meet student needs and technology is increasingly relied upon to deliver course content, we anticipate continued growth in blended learning. With this growth, it is imperative that institutions create an effective learning environment that supports student success. 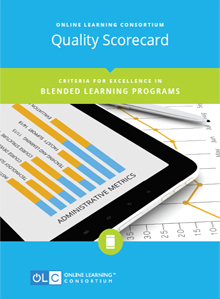 With the Quality Scorecard for Blended Learning Programs, institutions now have a way to validate their blended learning program, as well as the option for a formal review provided by the OLC, which could lead to an official OLC endorsement.